Gotta admit, I'm a philatelic Francophile! Craig Moi aussi. Though I am not keen on the more recent definitives. I love French culture too: and the cuisine; and the vin blanc. There are of course Chateaux all over France. Here is the Château de Fougères in Eastern Brittany, one of the largest medieval castles of Europe, with 13 towers. There was an earlier wooden castle on the site, but Henry II of England destroyed this in 1166. In 1449 an English mercenary took it by surprise, but the French regained it some 40 years later, and it has not seen military action since. 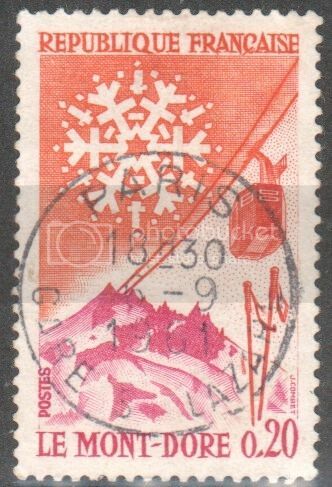 The stamp is SG 1462 of 1960. The Franche-Comté in Eastern France was for centuries part of Burgundy, and only definitively became part of France in 1678. 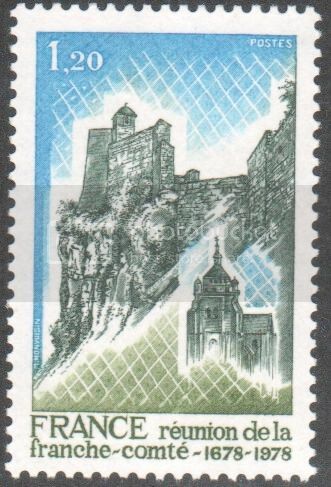 Here is a 1978 stamp, SG 2276, issued to mark the 300th anniversary of that occasion, showing a hilltop citadel with a church. Nancy in N E France was for a long time the capital of the Duchy of Lorraine. In 1737 the Duchy was granted to Stanisław Leszczyński, who had lost the Polish throne, as part of the settlement terms following the War of Polish Succession, but with the agreement that the Duchy would become part of France on his death - which duly happened in 1766. In the middle of Nancy is the Place Stanislas, which Stanislaw had built in the 1750s, and which is a UNESCO world heritage site. Here is the Place Stanislas on two (rather grubby) examples of French stamps of 1947 and 1948, SG 982 and 982a. Le Quesnoy in NE France, near the Belgian border, features on a 1957 stamp, SG 1334. Those who live there (less than 5,000) are known as "Quercitains". France acquired it only in 1654. For three years after the end of the Napoleonic Wars, the town was occupied by the Russians, and there was quite a bit of intermarriage between Russian officers and local women. On the first Sunday of August a statue of a legendary local giant parades through the streets, with a distribution of sweets. Still on a military theme, here are the ramparts of Brouage on SG 1268 of 1955. Brouage is a fortified town on the Bay of Biscay, founded in 1555. For North Americans, its main claim to fame is that this is where Samuel de Champlain spent his youth. Champlain was the explorer who founded the first permanent European settlement in North America North of Florida in 1605 at Port-Royal in what is now Nova Scotia, and then Quebec City in 1608. Champlain oversaw the initial development of New France - the name given to the French settlements in what became Canada and the NE USA. Huguenot protestants in France suffered considerable persecution under Louis XIV, who reigned from 1643 to 1715, and persecution officially continued after the Sun King's death, although magistrates were often slow to enforce the laws. Among those who suffered were men and women imprisoned in the 13th-century Tower of Constance in Aigues-Mortes in Southern France (a place which had a century earlier been an official safe haven for protestants) for refusing to convert to Roman Catholicism. In 1768 the last surviving dozen (female) prisoners were finally released. 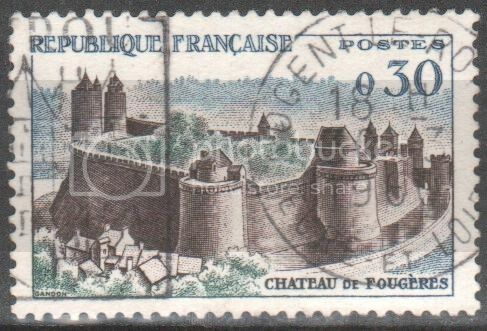 In 1968 France issued a stamp, SG 1801, to mark the bicentenary of their release. Alphonse Daudet (1840-1897) was a French writer who made his name with a delightful set of short stories called Lettres de Mon Moulin (Letters from my Windmill), centred on a windmill at Fontvieille, a small commune in the very South of France. 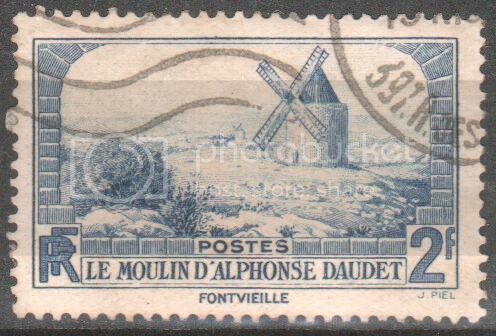 In 1936 France issued a stamp, SG 544, showing the windmill. A long way North of Daudet's windmill, not too far from France's borders with Germany and Switzerland, is the village of Ronchamp. Today it is famous for one of the most iconic buildings of 20th-century architecture, the Chapel of Our Lady on High (Notre Dame du Haut) designed by Le Corbusier to replace a previous chapel destroyed during WW2. 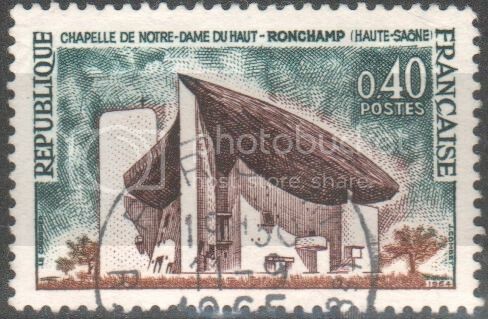 Here is the chapel on a 1964 stamp, SG 1654. After all this distance cycling, we need to recuperate, so let's hop to a small spa town, Le Mont-Dore, in the Massif Central, the mountain region in the middle of France. The thermal springs there have been known since Roman times, but there is only a short summer spa season because the climate is quite harsh, as it is a long way from the sea, the average height is almost 3500 feet, and the valley where the town is situated is exposed. In winter, the town is a ski resort. Here is a 1961 stamp, SG 1536. Further South, in Aveyron (which has some delicious regional food), is the hillside village of Conques. The main site there is a medieval abbey, which was on one of the Pilgrimage routes to Santiago da Compostella. Medieval pilgrims stopped there to see the relics of St Foy (St Faith), a third-century woman said to have been tortured to death with a red-hot brazier for refusing to make pagan sacrifices. These relics were piously stolen by a monk of Conques in the 9th century, from their previous repository at Agen. Conveniently it was said that St Foy would indulge in uncharitable and sometimes rather sadistic punishment of those who did not give enough to the Abbey - this did nothing to hurt the Abbey's coffers! The earliest surviving poem in Catalan, from the mid-11th century, celebrates her. Conques Abbey dates from the 8th century, when monks fleeing Muslim invaders of Spain built an oratory. The current buildings are mainly from the 11th century. The Abbey is a UNESCO world heritage site, and features on two French stamps of 1947-8, SG 1021 and 1022. Another long journey, to the River Doubs, which forms part of the Franco-Swiss border and is a 281-mile-long tributary of the Saône. Here is a waterfall on the river, on a 1973 stamp, SG 2005. Still in mountain country, but much further West, in South-central France, is Le Puy-en-Velay, a town which was an important medieval bishopric and has a chapel perched dramatically on a hilltop and dedicated, like many church buildings on hilltops, to St Michael. It was a pilgrimage destination, and Charlemagne himself twice made pilgrim visits. The Marquis de Lafayette, who supported the Americans who fought Britain in the American War of Independence, was born nearby. 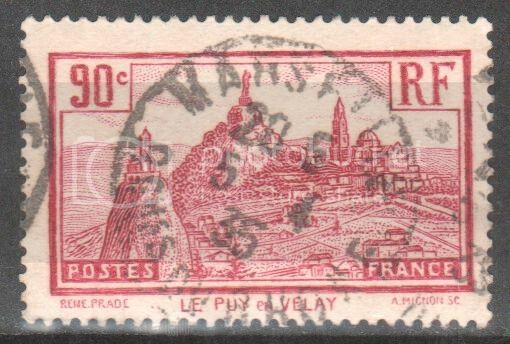 A French stamp of 1933, SG 470a. 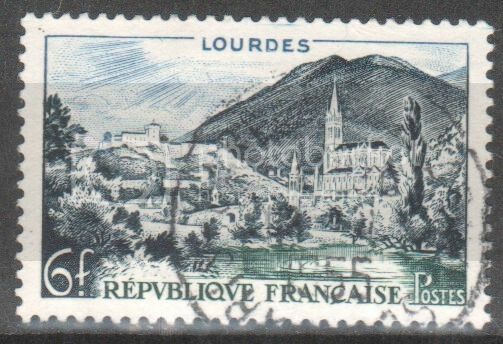 On West again, to the foothills of the Pyrenees, and what must be the most famous pilgrimage destination of France, Lourdes, on a 1954 stamp, SG 1205. Just the place to recuperate and gather our strength for more cycling on another day. In the area of the Rhone delta is the village of Puyloubier, where you can see the Chapel of St Ser, whoever that saint was (she or he does not feature in my dictionary of saints and I cannot find any reference in Wikipedia). In the village is an institute for injured members of the French Foreign Legion, with a memorial to legionnaires who died in action. There is, naturally (it being France), a wine-growing domaine called the Domaine de St Ser, with 100 acres cultivated. The local mountain, the Mont St Victoire, was painted by Cezanne numerous times. 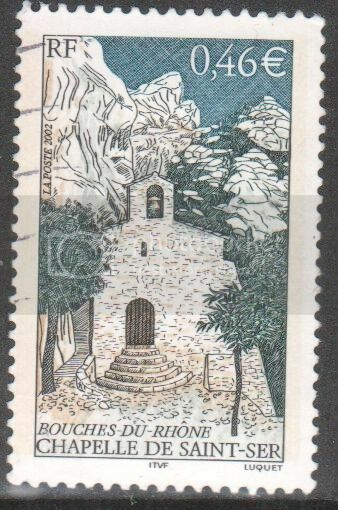 Here is the Chapel of St Ser on a 2002 stamp, SG 3837. Back quickly to central France, and the Auvergne. Riom was the capital of the Auvergne before the French Revolution, and evolved from a pre-Roman settlement. It grew around a church dedicated to a local saint, St Amabilis of the 5th century, about whom we know little except that he was a cantor - so he must have had a good singing voice - and was respected for his holiness in his lifetime (nothing particularly unusual in a saint!) It was at Riom that Marshal Pétain unsuccessfully tried, in 1942, to have the leaders of the French Third Republic condemned for France's 1940 defeat by Germany, in a trial backed by the Nazis. The trial was suspended after a few weeks when it became clear that it would turn into an embarrassing fiasco for the Vichy regime. 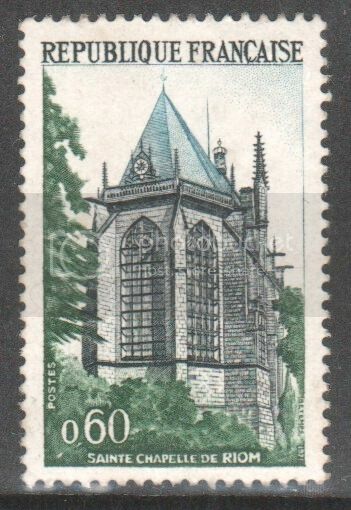 A stamp of 1971, SG 1929, features the Sainte Chapelle of Riom, a 15th century building largely modelled on the famous Sainte Chapelle in central Paris. 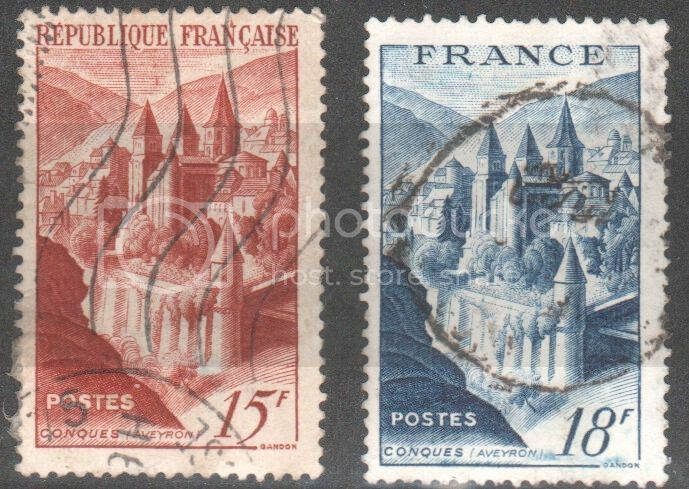 Also in the Auvergne is Saint Flour, featured on a 1963 stamp, SG 1621. The small town is in two parts - an upper town built on a volcanic dike, and a lower town beside the River Ander. The remains of two modest-sized Roman villas can be found in the neighbourhood, along with some dolmens showing earlier occupation.